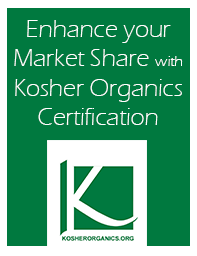 KOSHER ORGANICS GUIDE is the leading directory of organic, natural and green kosher foods and products. We offer three listing levels: Basic, Superior and Premium. BASIC level listings appear below any SUPERIOR and PREMIUM listings. Includes listing in only ONE category but you can buy additional categories of $20 each. Company name, Address, Phone, Email, Website link and a brief company description; plus a welcome announcement in our social media pages. SUPERIOR level listings appear in search results above BASIC listings and under PREMIUM listings. Includes listing in up to 3 categories. You can buy additional categories for $20 each. Company name, Address, Phone, Fax, Email, Website link and a brief company description, and Certification(s); plus a welcome announcement in our social media pages. PREMIUM listings appear in search results above BASIC, and SUPERIOR listings. PREMIUM listings appear in up to 5 categories making it easy for a customer to find your company. You can buy additional categories for $20 each. Company name, Address, Phone, Fax, Email, Website link, Company Logo, a detailed company description. Plus, a welcome announcement in our social media pages. Only PREMIUM listings can offer COUPONS. Coupons are Free with PREMIUM listings. $1,000 for six months and $1,800 for an entire year display banners that match directory content. Reach health conscious consumers seeking information on organic, natural and green healthy products. Reference to your PREMIUM listing for Coupons. Please note, your banner ad will be in rotation with others that have also purchased positioning for that spot. Please fill out our Submit Your Listing form to submit your company information to KosherOrganicsGuide.com.